Mural by the Mosaic Mob. Photo by Melanie Stuy. 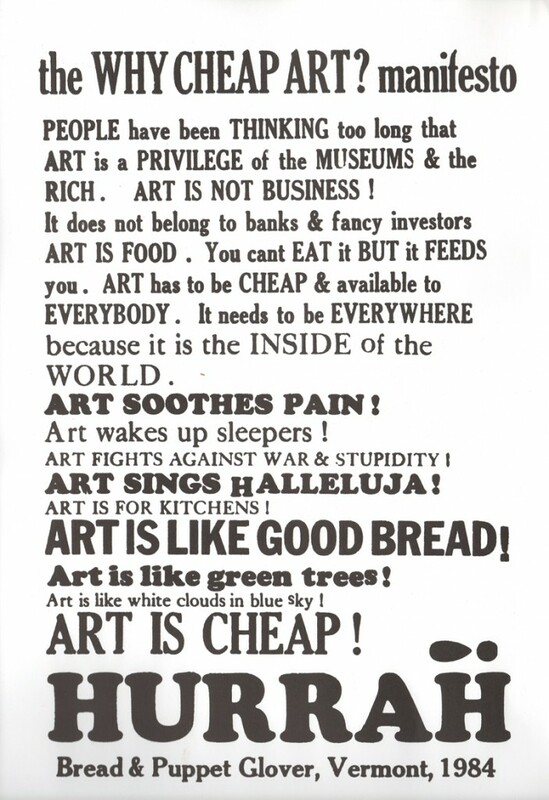 The Cheap Art Collective takes it’s name from the Bread and Puppet Theater’s Cheap Art Manifesto, and is a decentralized group of community activists and artists that believe in taking art of out of galleries and putting it back into the hands of regular people. The Cheap Art Collective came into being out of several influences and initiatives. Melanie Stuy and Yvette Salinas, both residents of the neighborhood of St. Raymond’s in Montreal, met at a local collective garden. They started doing art projects with other gardeners and neighbors as a way to stay connected after the gardening season was finished. One of their first collective art projects was a solar system made of pumpkins and an old umbrella for the annual pumpkin decorating contest at the Montreal Botanical Garden. They just kept going from there. 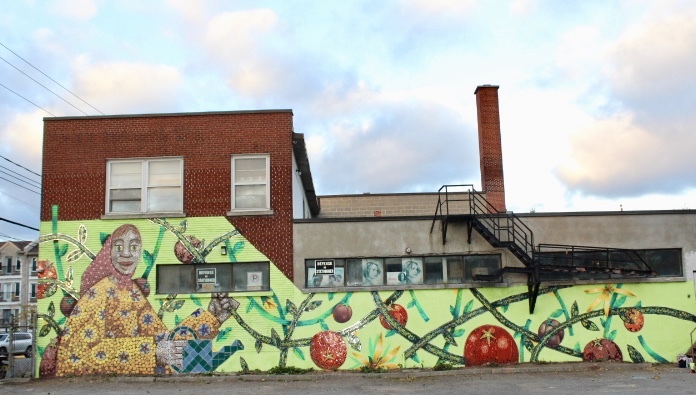 Some of their projects took on a more political tone as they sought to address some of the issues and class discrimination that affected their small, isolated, multicultural neighborhood through community art. They initiated and facilitated such projects as a photo gallery in their community garden and an annual project to decorate a pedestrian tunnel for Halloween. Melanie Stuy and Amy Barrington, who also met through collective gardening, decided to head down to Vermont and check out Bread and Puppet Theatre. They volunteered to participate in one of their weekend performances and loved it so much they wanted to bring some of that energy back to Montreal. They threw together their first community puppet show in a couple of weeks and performed it at the Action Communiterre Harvest Party, with the participation of whoever wanted to join in. The Chaotic Insurrection Ensemble agreed to provide music for the show. Though this first show was rough and unrehearsed, when Amy Barrington’s giant caterpillar made its appearance everyone joined in the parade, banged on pots and pans or whatever they could find and the performance ended with everyone dancing. It was truly a magical the way everyone seemed to forget themselves and get lost in the joy of the moment. The Cheap Art Collective has put on an annual puppet show at Country En Ville as part of Artsweek N.D.G. ever since. These people and projects all came together united under the name of The Cheap Art Collective. Since that time, the Cheap Art Collective has added to its list of achievements the creation of the N.D.G. Art Hive, an open studio that takes place in the chalet in N.D.G. Park on Saturdays during the summer, and also the creation of a mosaic mural in the Villages Des Tanneries in St. Henri. The Cheap Art Collective would like to thank Home Depot for supplying all the grout and tile adhesive for the mural.